Hurricane Earl has weakened to a Category 3 storm as it threatens to sideswipe the East Coast. And a hurricane watch that had been effect for the North Carolina coast was extended to the Virginia coast early Wednesday. Earl's maximum sustained winds have decreased to near 125 mph). But the National Hurricane Center in Miami says fluctuations in strength are possible over the next 48 hours. Earl was located about 815 miles south-southeast of Cape Hatteras, N.C., and moving northwest near 16 mph. The looming storm just ahead of Labor Day was worrying countless vacationers who planned to spend the traditional last week of summer at the beach. The Federal Emergency Management Agency warned people along the Eastern Seaboard to prepare for possible evacuations and islanders in the Turks and Caicos hunkered down in their homes Tuesday as the then-Category 4 hurricane steamed across the Caribbean with winds of 135 mph late Tuesday. North Carolina officials announced the first evacuation would be Ocracoke Island beginning at 5 a.m. Wednesday. Tourists would be ordered to leave the barrier island accessible only by ferries, but those who live there year-round have the option to stay. In Hatteras, N.C., people are starting to worry about beach erosion, CBS News Correspondent Don Teague reports. The Outer Banks are shrinking with some beaches losing 15 feet of sand per year. After Hurricane Isabel in 2003, the main road in Hatteras washed away. Forecasters cautioned that it was still too early to tell how close Earl might come to land, though hurricane watches were out from Surf City, N.C., to the Virginia coast. 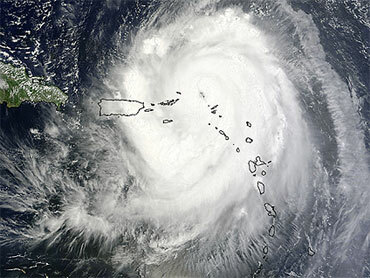 Not since Hurricane Bob in 1991 has such a powerful storm had such a large swath of the East Coast in its sights, said Dennis Feltgen, spokesman for the National Hurricane Center. On Tuesday, gusty winds from Earl's outer fringes whipped palm fronds and whistled through doors in the Turks and Caicos Islands as tied-down boats seesawed on white-crested surf. Close on Earl's heels was Tropical Storm Fiona, which had weakened considerably and not expected to get stronger at least for a couple of days.